From left to right: Jonas Nits (Keyboards); Mikael Larsson (Guitar); Jari Katila (Drums); Niclas Birgersson (Vocals); Johnny Rosengren (Bass). The band was formed in 1989 when the band took their new name Wistaria. 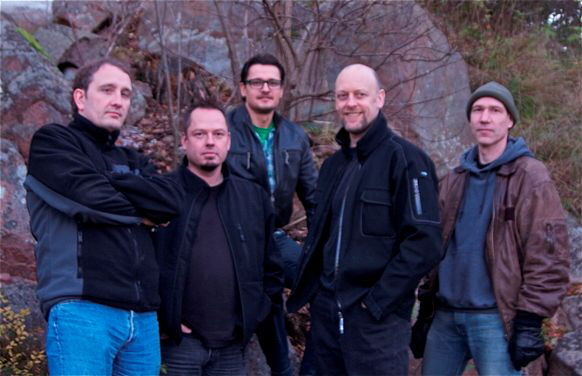 With the new name change from Tucana, there was also a line up change where Jonas Nitz left the band, leaving Niclas Birgersson (vocals and writer) and Magnus Carlberger (keyboards, guitar and writer) searching for new members. Shortly after the reformation, Mikael Larsson joined in on Guitars, followed by Magnus Andersson on drums. In March 1989 Johnny Rosengren joined as the new bass player and the band was almost complete. Because of the complexity of the music, a second keyboardist was needed. After Wistarias first 5 song Demo, Mikael Gullmes joined the band late 1989 by showing of his talents in a very extreme way. In 1990 the band was recording their 12 song demo and rehearsing for the coming shows, but in April the same year, after their debut concert, Johnny left the band after disagreements. A new bass player, Uffe Johansson, was recruited for a coming demo and some more shows, but shortly after, Mikael Larsson also left the band. Wistaria continued for a while longer, but the air had gone out of the band, as well as the lust to play. When Niclas decided to leave, the end was imminent. The story could have ended there, but it didn’t. When it looked like the band had totally dissolved, Niclas Birgersson reunited with guitarist Mikael Larsson. Together they started working with the new guitarist Stefan Lindgren, although at this time, they didn’t call themselves Wistaria. A demo was recorded in 1992 bringing in the old bass player Johnny Rosengren for old times sake. There where other constellations as well during this time, with Magnus Carlberger and Mikael Larsson. This continued for a couple of years. By the end of the millennium, Niclas and Mikael, who had continued to work together, decided that it would be under the name of Wistaria, although they never really got out there. Many years later, in 2008, the very first original keyboard player from when the band was still named Tucana arrived as the new keyboardist. Jonas Nitz started helping the band to restructure the songs. Shortly after, they recruited the original bass player Johnny Rosengren to the band once more. In 2010 the new drummer Jari Katila joined the band. Shortly after that, the recordings for the debut album began. But with recording issues and other problems lining up, the band who re took the name Tucana, so they would not be mixed up with another band with the name Wistaria, have been struggling to get the recording down. It is expected that the recording will be finalized by the end of 2011 and due for release in 2012. The music can best be described as; Baroque progressive metal.